Students from Warren Tech’s Health Science program are participating in an exciting way to learn more about specific fields within the Health Science industry. 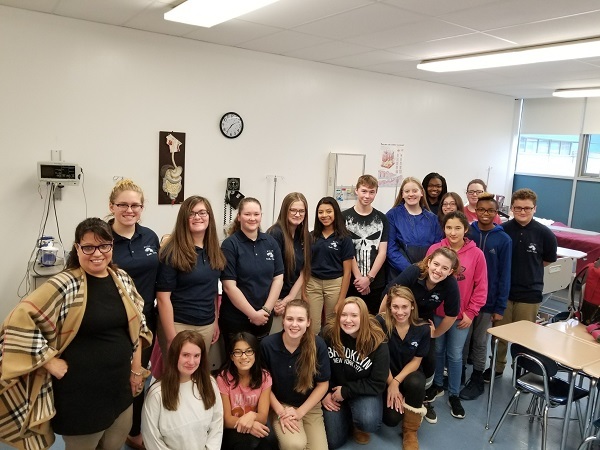 Through St. Luke’s Warren, Health Science students are visiting healthcare facilities and shadowing professionals in the industry through the Health Explorer's program. Students are given the opportunity to observe different areas of healthcare, such as phlebotomy, simulation lab, and Emergency Department to gain a feel for the professions in these areas and others. The Health Science Explorer program provides students with the opportunity to discover which field(s) of medicine they are truly interested in pursuing so they can plan their pathway to attaining that career. From left to right back row:Mrs. Tamburro, Megan Starck, Elizabeth Petlick, Rachael Payne, Brianna Crincoli, Jhoana Paisano, Liam Delahunty, Hailey Ebner, Olivia Johnson, Briana Villegas, Dayna Whitmore, From Left to right front row:Carlie DeStefano, Adriana Campbell, Natalee Segreaves, Ryanne Catanzaro, Alyssa Larsen, Rachel Pagano, Destiny Carrion, Matthew Lawson, David Domingues.